Hello again, friends of the Fort Collins Wind Symphony! 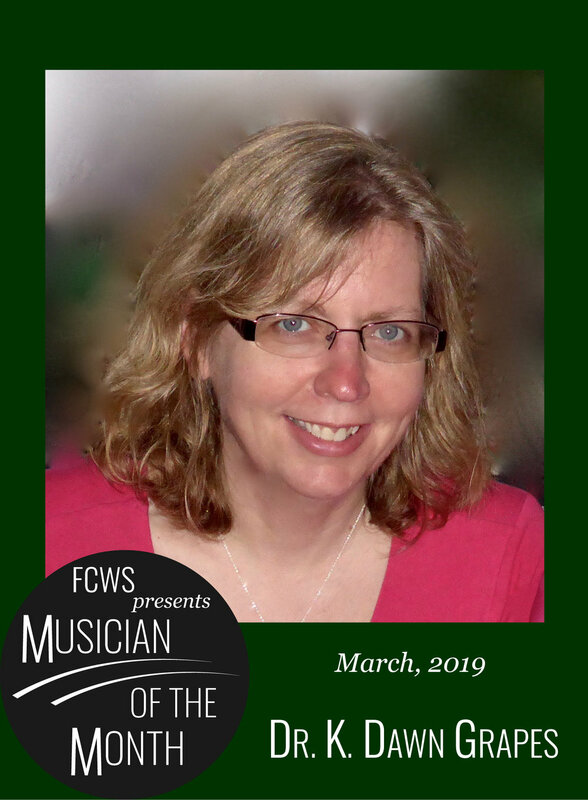 We’re back with another edition of the Musician of the Month, and are pleased to feature one of our flutists, Dr. K. Dawn Grapes. Dawn is an active performer in the Northern Colorado region and has served as the FCWS principal flutist for several years. When she is not performing, she is engaged in scholarly pursuits at Colorado State University where she teaches music classes and studies music history. Her history expertise is well known in the Northern Colorado region - she writes program notes for the Colorado Bach Ensemble, and hosts the “Composer Talks” lecture series for the Fort Collins Symphony. A full detail of her academic work can be found at her website. We sat down with Dawn and picked her brain about music and the importance of music history. FCWS: In your words, please tell us who you are and the role you play in the Fort Collins Wind Symphony, and then please tell us a little about your music career. Dawn: Well, I am a musician, a teacher, a scholar, a wife, a mother, and hopefully a decent human being, not necessarily in that order. In the Fort Collins Wind Symphony, I serve as principal flutist, which is a pleasure and an honor. My music career has sort of taken two tracks. For about twenty years, I was primarily a freelance flutist, doing a variety of things. I played with professional orchestras in a number of states, had my own teaching studio, taught at several universities and community colleges, and was a freelance performer and contractor in Nashville. I have always had a special interest in music history, however, and about ten years ago, I decided to get my Ph.D. and travel down the academic path, and here I am today, on the faculty of the School of Music, Theatre, and Dance at CSU, as an Assistant Professor of Music History, and delighted to be surrounded by music and history every day. FCWS: So far, we’ve featured a combination of educators, composers, and professional performers. In addition to your education and performing, you are a professional musicologist. Can you tell our audience what musicology is? Dawn: Musicology is just what it sounds like: the study of music. It often gets categorized as the academic side of music studies. There are a number of different sub-fields within musicology, such as ethnomusicology [the study of music within cultures], performance practice, theory, phenomenology, popular music studies, and historical musicology, which is what I do. FCWS: As a musicologist, what is your primary area of expertise? Dawn: My research right now mainly revolves around music and musicians in early modern England—the Tudor and Stuart eras. I try to find out and elucidate how music of the time reflected the values, beliefs, customs, and social structures of Elizabethan and Jacobean England. In many cases, though the place, time, and technology may be different, there are a lot of parallels to our present day, some four hundred years later. My latest project is on John Dowland, the “rock-star lutenist” of the early seventeenth century. FCWS: Why is it important to understand and study the history of music, including and beyond western art music? Dawn: Music, in some form, is practiced in almost every time and culture. In many ways, it serves as a way to tell the story of any particular group of people. Studying a people’s music can help add a dimension to understanding them. There is a who, what, when, where, how, and perhaps most importantly, why, behind every piece of music. Sometimes the answer to that “why” is complex and sometimes very simple, but it provides a lens through which to understand people who are like you and people who are different from you. What could be more important? FCWS: For our younger listeners, can you describe what a career in musicology looks like? What sort of professional options exist for musicologists? Dawn: Musicology is such a broad field. There are many different roles musicologists play, and many paths that one can take in the discipline. The most obvious is university professor, but there are other options: archivist, museum curator, librarian, writer, copyright specialist, advisor to film or television studios, editor for book or music publishing, and of course, performer, for some. FCWS: When you’re not working on your research and teaching at CSU, you perform regularly with several small ensembles in the Northern Colorado region. Can you tell us about the other ensembles you perform in? Dawn: I am a founding member of a flute-clarinet-piano trio called Sound de Trois, which specializes in contemporary chamber music, and I am part of a group called Hyperprism, which presents chamber recitals and takes on recording projects. In some ways playing with groups that play contemporary music balances out the early music researcher in me. I also do a lot of church gigs around town, and have a special affinity for collaborating with organists. The flute sounds really nice with pipe organ pipes. FCWS: Is classical music “dying” in the 21st century, or is it still relevant for our culture? Dawn: People have been bemoaning the “death” of classical music for decades. But in a lot of places, the art music world is still going strong. I do not see the end in sight. As an early music historian, of course I think older music is relevant. However, I also believe that there is room for new music, and innovation is a beautiful thing. My favorite pieces of music that fall under the “classical” label are often those newer pieces that draw from the past, but are infused with modern sensibilities. Wind music composers often understand that, which is one of the reasons I really enjoy playing with the Fort Collins Wind Symphony. In historical research, we build on what those before us have done. It is inevitable. Why not music? FCWS: What does the future of classical music look like? Dawn: I know better than to try to predict the future. But in this newest era of globalization, I hope that music of all kinds, art music included, brings us all a lot closer together. Welcome back, and happy 2019! 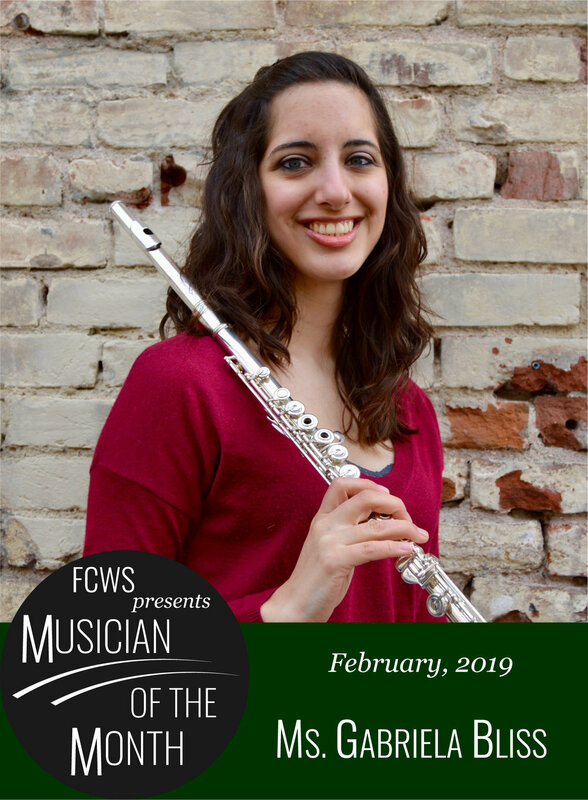 We are excited to kick off the second half of our 2018-2019 season with our February Musician of the Month - Gabriela Bliss. Gabriela is an active freelancing musician and private instructor in the Fort Collins area. She performs frequently in the Northern Colorado region, and is a regular at the Candlelight Dinner Playhouse. If you’ve heard flute at an event, there’s a high likelihood that you’ve heard her perform! She maintains an active studio and is establishing herself as a strong pedagogical presence. You can read more about her on her website (gabrielablissflute.weebly.com). We caught up with her recently to hear her thoughts about professional musicianship and classical music in the 21st century. FCWS: Tell us a little bit about who you are and the role that you play in the Fort Collins Wind Symphony, and then tell us a little bit about your musical career. Gabriela: I am Gabriela Bliss, and this is my first year as the piccolo player for the Fort Collins Wind Symphony, although I have subbed for the group in the past. I got my Master’s in flute performance from CSU, and my Bachelor’s from Northern Arizona in music performance, and this is my second year being a full time freelance musician. 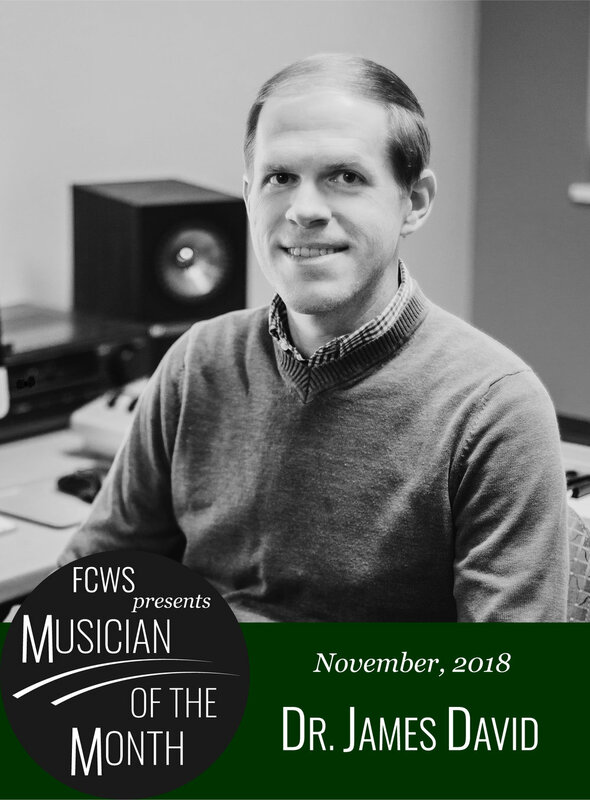 FCWS: Up to this point, we’ve featured mainly music educators – plus James David, our composer in residence, if you will – but you are our first gigging musician to be featured. Can you tell us a little bit about what it means to be a gigging musician? Gabriela: Well it’s been amazing so far, but to be a gigging musician it’s about taking gigs wherever you can. Currently I’m at Candlelight Dinner Playhouse and freelancing and doing what I can to live this life! I’ve learned so much from working with colleagues around the Northern Colorado area. And it was scary at first when I quit my day job, but it was a risk worth taking. FCWS: And I should mention that you are also a music educator, you’re not just a gigging musician. You teach private lessons. Gabriela: That’s right, I have a full private studio, and I teach sectionals at various high schools in the area. FCWS: Can you provide some honest insight for our readers: what is the job market like for professional musicians, and what does it take to be a modern professional musician? Gabriela: Well in Northern Colorado, I’m going to be honest, it’s difficult. When I first ventured out into making this my full time career, it took me a good six months to secure a consistent gig. And up until then I was relying solely on my private lessons and the work I was doing at the schools. I believe a lot of time we get into this tunnel vision where our only careers as musicians are teachers and performers, but really there’s so much out there that is accessible to us. There’s composition, like Dr. David, and arts administration, and instrument repair. There’re so many things out there – like, we need more instrument repair people around. I think that’s just one of things we have to remember, to keep it open, and not just be in tunnel vision of one track. FCWS: For our younger followers, can you tell us the skills you’ve developed or the skills you see in others that are necessary to be a successful modern professional musician. Gabriela: Absolutely. One thing that I think is super important to stress is always be professional and punctual. I’ve had a couple times where I’ve lost gigs because I didn’t respond quick enough to the email. Be prompt with your responses. And then, being professional – what does that mean? Show up to your rehearsals well practiced, and early so you have time to prepare. A colleague told me recently to treat every performance like an audition, because you never know who’s listening. FCWS: Now for something a little more personal, why did you choose a career in music? Gabriela: Honestly, I chose it because I was very inspired working with professionals in high school. I just really enjoy playing in groups, that’s where I really thrive, and I love feeling that we’re all working together to accomplish this goal and entertain people. FCWS: Do you see classical music as an important music genre for the 21st century, and for the most recent generation of individuals, Generation Alpha? Gabriela: Definitely! I think especially with Generation Alpha, a lot of people are always on their phones, they have the technology right at their hands, but music is evolving to involve more electronics. It’s also very personal, and you have to communicate with people face to face to accomplish this goal, so I think it’s very important. FCWS: So thinking about the value of classical music – its importance in the 21st century – what sort of value does an organization like the Fort Collins Wind Symphony have for its community? Gabriela: Well I believe the Fort Collins Wind Symphony is very accessible to the community. Not only do they offer free concerts to the community but we’re performing music from all genres including from composers that are still living today. I think that’s super important. Just to have a group that is full of educators and musicians and composers, it’s a great pool for students to go to their teacher and say “I need lessons” or “Who can I talk to for composition?” or whatever it may be. There are people within our group that probably can do one of everything. FCWS: Now, to wrap up our interview – thinking into the future, what does the future of classical music look like? Gabriela: I think it’s looking very positive, to be honest. I have already a couple students who are juniors and seniors that are wanting to major or minor in music. Starting them when they’re in band is a great tool and they love it so much and they want to do something with it. I think that’s super important, to continue working on that skill. FCWS: The future is bright. Welcome to a special Sunday edition of our blog, Musician on the Month! For the month of December, we are proud to feature one of our horn players, Ms. Charlotte Harsha! Charlotte has devoted her life to music, and when she isn’t performing with the FCWS or a number of her other groups such as the Colorado Brass Quintet or the Friends of Loveland Chamber Music, she teaches middle school band at Blevins Middle School, in Fort Collins. More information about her background and teaching can be found at the Blevins website (https://ble.psdschools.org/users/charsha). We are grateful to have Charlotte in the FCWS and excited about her future as a music educator in Northern Colorado. We interviewed her to hear her thoughts about music and music education in 2018. FCWS: To get us all started, why don’t you tell us who you are, what you do for the Wind Symphony, and then tell us a little bit about your musical career? Charlotte: So my name is Charlotte Harsha, this is my sixth year as a horn player in the FCWS, and as for my music career, I have my music education degree from UNC over in Greeley, and a Master’s in music performance from Boston University. I have been able to perform with lots of ensembles, both large ensembles like the Wind Symphony, and also chamber ensembles like Friends of Loveland Chamber Music, the Rocky Mountain Horn Ensemble, Colorado Brass Quintet, things like that. FCWS: The next question, more to do with your music education background, can you tell us: what does it mean, and what is it like, to be a music educator in 2018? Charlotte: Tough question! I believe music education plays a really vital role in a student’s overall education, and participating in music gives students multiple opportunities to exercise their brain in different ways, express creativity, learn how to collaborate with peers and work toward a common goal, exercise critical thinking skills, and they also learn self-motivation, self-management, responsibility and perseverance, and I think music educators are really lucky and we have a really unique position to provide all that for students. We use music as the medium but students are learning all these life skills in one environment and being set-up for success for their future. FCWS: That’s great! And I think we should mention that you teach at Blevins Middle School. When did you start that gig? Charlotte: This is my sixth year there. FCWS: So, over these six years you spent at Blevins, as a music educator, what have been some misconceptions that people have had? And by people I mean non-musicians and musicians alike. Charlotte: That’s a good question. And it’s a hot topic right now, with student/teacher walk-outs, and all this stuff that’s going on in our education system. There’s a lot of misconceptions I think, and I think some of it people come by honestly. They just don’t know what they don’t know. I’ve heard things like “Teachers get paid to take the summer off”, which is not true – I can get on that soapbox a different time. Or, one thing that was said to me this year “In music class, all they [students] do is just play and have fun, so really, what’s the point?”. But I’m going to spin your question a little bit and try to address those from a more positive standpoint. The first thing I like to touch on is that teachers are professionals. We’ve gone through training, many teachers have gone for graduate level degrees, and we’re experts in our field. We know what we’re doing and we’re trying to do our best for kids. And then another one is that we don’t go into it for the money. Like I said, we actually don’t get paid for summers off. I think teachers enter the profession because it’s a calling. We don’t show up and work nine to five and then just go home. We stay at school late, we take work home with us – which is not always good, but it happens – we provide opportunities for kids that happen outside of the work day or even on weekends, because it gives them chances to do something that they couldn’t otherwise do. We don’t do that for accolades for ourselves, by any means. There are easier ways to earn accolades. But we do it for kids and we do it to give them a chance to learn and thrive in different ways. When I think specifically about music education, one positive that I see in some of my students is music provides for them a “safe-place”. We talk about it my band like a second family. They have their peers in band or orchestra or choir or art or whatever it is, and they find their niche. They find their place where they belong and succeed. And we do have fun in band, and we don’t think there’s anything wrong with that, to be perfectly honest. Penalizing the arts because students have fun for participating in them doesn’t make sense to me. Of course it’s fun! I think if it’s not fun there might be something wrong. For a lot of kids, the arts are their hook: that’s why the come to school, that’s why they’re there, and that’s what keeps them engaged. FCWS: That was great. I think that touches on concerns that people might have about the arts, in public education particularly. I’m going to jump around a little bit and I’m going to ask you: why is it important to teach music to kids in the first place and particularly why is it important to teach this classical or jazz style? Charlotte: I love this question. Music is super important for kids. I think classical music, or jazz music, provides that “level up” in discipline, or intensity if you can use that in a good way. Through classical music, I’ve seen kids learn skills that will benefit them in life, they’re learning skills that employers are looking for when going through the hiring process. Kids have the opportunity to work hard and thrive on the success that hard work brings them. There are statistics all over the place, I read one just the other day, that kids who have experience with music performance score higher on the ACTs. The article I read said 63 points higher on their verbal scores and 44 point higher on their math scores. There are other studies that I read showed that when they’re exposed to classical music training, they’re developing language and reasoning skills, they’re learning craftsmanship – not just putting forth mediocre work but actually taking pride in creating good work – increasing coordination, musical training helps students learn pattern recognition, tune fine auditory skills, and build imagination and curiosity. Which is something I think we hear a lot of the top employers talk about as things they want in their employees. I think music is really important. It provides kids with all these opportunities that, should they choose to stay in music, will benefit them in their musical career, but even if they don’t stay in music as a performer, they’ve learned these life skills that will make them successful no matter what they do in their future. I think it’s really important. FCWS: I agree, I think it’s really important, and you touched on some really great points. Now, I’m to assume that you like your job. What do you enjoy the most about teaching music in a middle school? Charlotte: Specifically in middle school, I *love* beginners and teaching musical fundamentals that will set them up to be successful in the future. I absolutely love the “ah-ha” moment and I think in middle school you get a lot of that. You go from day one “I don’t even know which end of this to blow into” and within a month they’re playing hot-cross buns and you can recognize the tune! And that’s just an example of sixth-graders, but any skill they’re learning it’s all new and it’s hard work. It’s not easy, but when they have that “ah-ha” moment and they realize, even beyond that, “Hey, my hard work actually pays off”: I love that. I love seeing that happen. FCWS: Thinking over the six years as an educator, a little bit about your musical career as a performer, teacher, what has surprised you most about a music education career? What did you face that you didn’t anticipate? Charlotte: One of the things I guess I wasn’t anticipating was figuring out a work-life balance, and I will tell you I’m still not very good at it. I talked earlier that teachers take their work home with them, they think about their kids and students all the time, and I’m really bad about that. Which isn’t terrible, because it helps me do better at my job, I’m just figuring out that work-life balance and knowing when to take a break. I think it all comes from a desire of wanting to improve and do well. I’ve been in music for almost my entire life, I love it, and one of the things that surprised me, I know how inspiring music can be, I know how amazing it can be to have great teachers – that’s why I am where I am today – but one thing I love about it, it doesn’t just stop being inspiring. Every day there’s something new, the kids are new, the challenges are new, and it gives a chance to grow and get better, and that’s one of the things I really like about it. FCWS: Now, knowing what you know, if there is a student that comes to you and says “I want to pursue this”, what advice do you have to tell them? Charlotte: My advice, firstly, would be to master your instrument. Work on your instrument, perform, learn music, because that’s going to your content in your curriculum. I think to be a good music educator you need to be a good musician. But even further, if I was talking to a college student in a degree program, I would say: get out and observe teachers, master teachers, and see what they do, see how they teach. Get out and work with kids: kids think in strange ways sometimes, so figure out how their brains work. It’s hard sometimes because we’re all super busy but I think that the best way to learn is to get out, observe, work with kids, see what happens. FCWS: Now we’re approaching the end here, and we’re going to think a little more abstract. As an educator, you work with students on a daily basis, what does the future of music look like? Charlotte: I think it’s really, really strong. Especially in a district like PSD, we have all these good teachers and all these good music programs, I think the future of music is great. I think there’s always going to be an aspect of advocacy and trying to teach anybody “These are the benefits, we need to support this, we need to keep the arts in the school”. That’s a learning process, we need to educate, but I think it’s strong. I think we have great students – I think it’s a bright future. We’re back for another exciting edition of our blog, Musician of the Month! For the month of November, we are featuring Dr. James David, composer and professor of composition at CSU. Jim has participated with the Wind Symphony for several years, and has been a featured composer several times with works for band alone and for clarinet solo with band. We are delighted to be performing one of his works later this season! You can find out more about Jim and his published pieces at his website http://www.jamesmdavid.com. We invite you to explore his oeuvre! Additionally, he has founded a music organization based in Northern Colorado, called Hyperprism, and you can find them on social media with the handle @hyperprism. FCWS: To get us started, would you mind telling us who you are, and what you do for the wind symphony, and then tell us a little bit about your music career? James David: I’m Jim David, and I am the bass trombonist with the Wind Symphony. I played in that capacity for two seasons now – before that I was a substitute trombonist and would come in when necessary but we had an opening and I had a chance to do that and that’s really exciting for me. Outside of that, I am a professor of composition and music theory here at Colorado State University, and I have been a musician for a really long time. I started in the 6thgrade playing trombone. All my family are musicians, my dad was a band director for 40 plus years, and so it’s kind of been something I’ve always been interested in. Especially composition, something I immediately was just fascinated by and it’s something that’s just very much a part of who I am now is making music. It’s really exciting to be able to do that full time. FCWS: As both a composer and musician – a performing musician – what do you think is the value that community music groups provide to their community? James David: I think they provide a lot of things, actually. One, it’s a chance for musicians like myself, who have more than one area of interest, it give us an outlet to play. You know, once you finish college, grad school, that sort of thing, sometimes it’s hard to find opportunities to perform so it’s really great to have that and it’s a very serious ensemble that is interested in playing interesting music. And I think it’s a chance for local people to understand that music is happening all around them and there’s a giant community of musicians all throughout this area in the Northern Front Range. It’s really amazing to me to see the diversity of the audience that we get at each concert, and such a tremendous opportunity for me to have not only the chance to perform but also have my music played by the wind symphony and for such a different type of audience, where most of my music gets played at colleges and that sort of academic environment. FCWS: We’re going to talk a little more about featuring composers, and contemporary composers, but before we do that I’d like to address that you have founded your own music organization called Hyperprism, is that right? FCWS: Could you tell us what is the mission and goal of Hyperprism in Northern Colorado? James David: Hyperprism is a group that I wanted to start because I felt like there were some types of music that I just really was passionate about and there wasn’t a great outlet for me to do it within the sort of university community. And one of those big things is chamber music, and particularly chamber music for winds and percussion. Chamber music is very much concentrated with music for strings and piano. And that’s great repertoire, I love all of that music and I love writing for those instruments but at the same time, being a trombonist, it’s just so gratifying to get the chance to play chamber music from time to time. So that was one of the big goals of it, of Hyperprism, is to create that. Another big goal was to feature composers from Colorado and from the rest of the country that might be looking for more opportunities to have their music performed, and to expose them to a wider audience. So that’s a big passion of ours, is to premiere as much new music as we possibly can each year. It’s a chance for me to also provide an outlet for some of my former students to have a group to compose for and interact with on a professional level. And third, I feel like Fort Collins is a community that is very open to new types of experiences, particularly when it comes to music, and I think so far we’ve had really great response and we’ve given four concerts in the past year in Fort Collins and Loveland, and it’s really great to see such enthusiasm for new music. Especially when it hasn’t been a big part of the culture here before then. Yeah, Hyperprism is something I am very excited about and I hope that some of the audience members from FCWS will want to come there, but also some of our members of the FCWS will perform with this group. Actually, we already have a couple, but we hope to have even more of them over the years. FCWS: That’s some good promotional material right there! So I’m going to focus on the idea of new music, which you emphasized with Hyperprism. Why do you think it’s important to feature and promote new music in such an organization? James David: Well, I think new music is something that is alive and it’s something that potentially can open a whole new range of experience for people as to what their idea of music can be. New music, or contemporary music, is something that a lot of people have bad associations with; there’s the whole legacy of twentieth century modernism where we wrote a lot of atonal music that’s kind of unpleasant sounding to most people. And I think the thing about the current definition of new music is really whatever the composer wants it to be, and you see a really wide variety of music being composed now. It continues to diversify – we continue to see more and more interesting types of new music every single year. So I think hopefully the kinds of music we’ll be performing and promoting will be, again, things that open the audience to new expectations about the definition of music. FCWS: So new music isn’t just avant-garde, academic types of music. It’s really more than just that. James David: Right, absolutely. And I think younger composers, people who are my age and even younger, are much more open about the types of influences that they have and are much more willing to combine different kinds of music. A lot of my music is heavily influenced by jazz, but in recent years it’s been more influenced by electronic music and rock music, and also traditional romantic and classical music as well. So I don’t think it’s easy to pigeon-hole new music as one experience anymore. FCWS: You mentioned a little bit about influences on your compositional style, so can you tell us a little bit about what your process of composition looks like? James David: Well, it doesn’t look like much, necessarily. A lot of it is me just sitting with a strained face and sort of being angry at my computer. It starts – there’s a lot of pre-planning involved, one level kind of brain storming a little bit. It helps me a lot to know exactly what kind of piece and who it’s going to be composed for. Most of my music is written on commission – I’d say 98% of it – and so then there’s a specific audience in mind and also specific performers and conductors involved. So that will help guide me a little bit of what the future direction of the piece will end up being. I usually go through maybe two months or so of just thinking about a piece before I ever commit any actual notes to paper. And then I’ll spend a week or so kind of planning things out, making this whole horrible chicken scratch that no one can understand but me. And I’ll bang on a piano for a while to try to figure out some actual pitches and that sort of thing. And then I eventually end up finally going to the computer and doing everything there. I do pretty much everything on the computer now because that’s just the expectation to produce absolutely perfect beautiful scores and parts. It just saves me time to go ahead and compose directly at the computer. So, yeah, music and technology are very much linked together now. Most of my time is still in front of a screen. FCWS: Fascinating. So the days of sitting and making an original paper manuscript are more or less over? James David: I think so, because most of the composers are expected to be their own editors and their own publishers to a large degree too. The digital world has really changed the whole way the music business works in so many ways, but in particular composition, and desktop publishing has really changed that expectation. FCWS: Was that something that you anticipated as you were developing as a composer? James David: Well, I’m not quite that old. I was using computers basically when I started. But I initially wrote pretty extensively by hand just because I didn’t own a really good laptop or have that ability to compose on the fly. I was dependent on my school’s computer lab to be able to do anything. For the first twelve or thirteen years, I wrote everything by hand, and would then transfer it to the computer after the fact. Since I’ve been out of grad school I’ve been pretty much had to do everything directly to the computer. FCWS: Now, thinking about composition as a whole: as a career, as a path for individuals to take, what would you say is the biggest misconception that you’ve seen students grapple with or that you’ve grappled with yourself? James David: Well I think the biggest misconception among just average people, and even a lot of musicians who are not composers, is that it is not divine inspiration. It is not this incredible gift that every single composer has. It’s like every other aspect of music. You have to practice it, you have to work on it regularly to become skilled at it. It’s very much, I’d say, 95% skill based and 5% creativity or talent or however you want to put it. I think most people who are trained musicians have the ability to be composers in some capacity if they just try it and practice it in the same way that they would practice their instrument. That’s the biggest misconception that I encounter all the time. People always ask me “How do you come up with such amazing ideas?”. Well I, really don’t. I just spent a whole lot of time studying other people’s music and then try to find a way to translate some of those ideas into my own music. It’s just a very long, slow process. FCWS: For the, let’s say, the young audience member who might be thinking that music is a viable career and that they want to dabble in composition, or start learning it, what would be your advice for them? James David: The biggest advice is just to try it. Just see if you can figure it out. That’s exactly how I started, that’s how every composer I know started. They just attempted it with no warning whatsoever. They just tried to see if they could figure something out. My very first piece I tried to write, I took a band piece that we were playing in my 6thgrade band and tried to take the melody from that and rearrange it and then write like a variation on it. And it was, of course, horrifyingly bad but it got me interested. My middle school band director was nice enough to actually read the piece with the band and take time out to do that, and that was enough to get me hooked from that point forward. And I’m still writing music for band 25 years later. It really is just that simple to me, you just have to try it, and then just stick with it. FCWS: We will wrap things up with this question, from the perspective of a contemporary composer, what does the future of classical music look like? James David: I think it’s going to continue to evolve, that’s an easy answer, but I think we’ve seen a lot of the experimentalism of the past few decades, maybe from the 1950s through the 1980s, that’s starting to settle out a bit. There’s less need to try to push the boundaries of music because we’ve kind of already explored that to a degree. I think the integration of music and technology is going to be something that is continually evolving over the next few years. I think that there is already some changes that are happening there that are interesting. And I think we’re going to continue to see different types of institutions become important. I think the days of the major symphony orchestras, the major opera companies, being the dominant institutions of music, I think those days are largely over. And I think they’re going to continue – it’s not that they’re going to completely die out, it’s just that they’re not going to have the same relevance that they once had. This is one of the main reasons I compose for band and that I am a big fan of the band community. They are extremely supportive of new music and particularly a lot of the college band directors that I know that I get to work it on a regular basis, they just are hungry for new music. Every single year they want new music and want it to be more interesting and more engaging and more difficult and more exciting for their audiences. I think the wind band is really where it’s at if you want to write exciting symphonic music and have a wide audience that is interested in supporting that, as opposed to the orchestra where they are kind of scraping along just to survive these days, and they don’t’ have as much time to devote to exposing new music to their audience. I really feel groups like the FCWS and university bands and professional bands are going to continue to grow in their importance to composers, and in particular composers of new music.